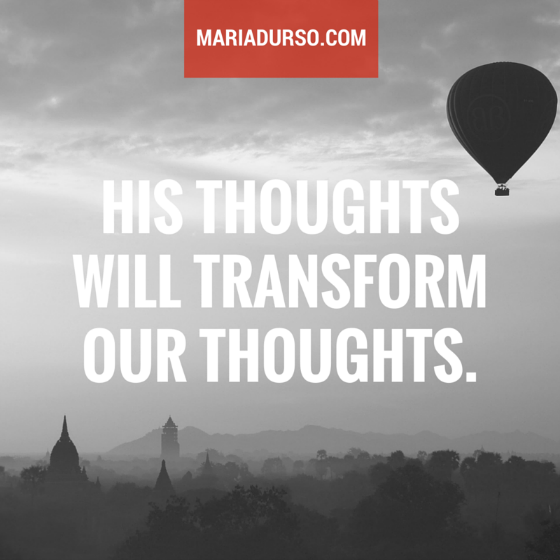 As we continually meditate on Him, His thoughts will transform our thoughts, producing right thinking within us. His Word, which is basically His thoughts on paper, must win this tug-of-war and bring down the proponent of oppositional thinking. The Word, which has the strength of a hammer, must continually dash against the rocky places, washing away all the weeds, boulders, and thorny places, crushing the way the brains in our hearts are used to thinking. As God’s Word continually soaks us, it will soften us, making supple and pliable all those rock-hard, resistant places. Then the Lord will be able to write on the tablets of our heart what He truly thinks about us. We must ask God for the grace to hold on to the promises and stand our ground so as not to allow a backup or a leak. What things have crippled you? What things from the past are still present with you? What would cause you not to see God’s plan for your life? “I pray that the eyes of your heart may be enlightened in order that you may know the hope to which he has called you” (emphasis added). Wow! Your heart not only has a brain, but it also has eyes—eyes that need to be enlightened so that you will be able to see the hope to which you were called. It’s not enough for our natural eyes to be opened. The “eyes” of our hearts must be opened! It’s imperative that the eyes of our hearts see Him high and lifted up!